A fairly quick paint-job on this one simply as I needed to get something 'done' in order to help me get over my latest bout of painters block. This mini is not really intended to go with anything I currently game, paint for or plan to do. It may get used in a planned 'pulp' style game I hope to do in the future (using some Reaper Chronoscope minis amongst others), but that will be a way off. 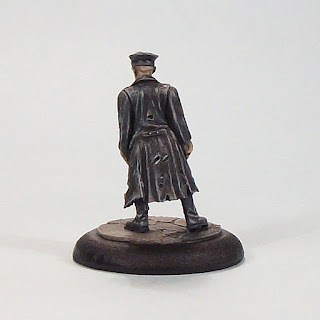 I also have a ton of AE-WW II minis, but cannot see myself getting into them any time soon. So a mini painted simply for the sake of it then. The mini is by Studio Miniatures, and the base by Fenris. Still doing some bits and bobs. 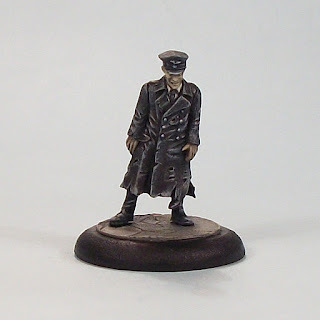 Today I have mostly finished a 'quick and dirty' paint job on a Zombie WWII German from Studio Miniatures; hopefully it will be finished in the next 2-3 days with pictures to follow. I have also started work on a new gaming project. Did some assembling today, including a bit of conversion work and bits-bashing. 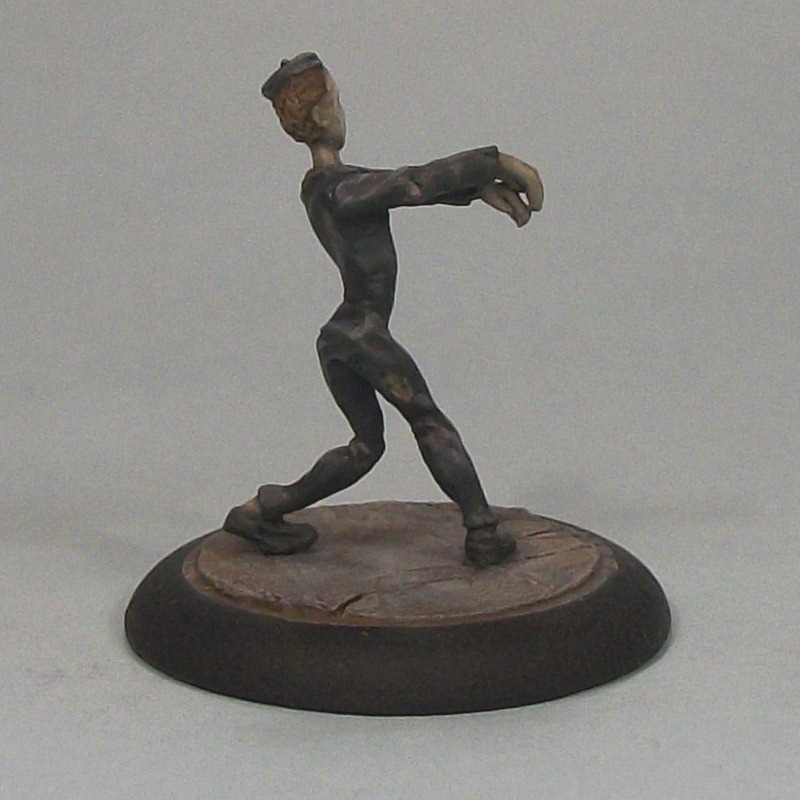 When I take pictures of the German Zombie, i may do a WiP of those as well. 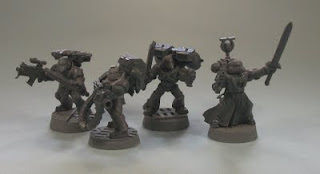 I have been following the work of Tommygun on the Warseer Forums for his paper-craft creations. However this thread has floored me. I am not an Infinity player so my interest is predominately about Tommygun's craft skills which are remarkable, I hope you will agree. There are tremendous examples of clean-lined sci-fi buildings all following a clear aesthetic thread. Brilliant stuff in my view. Okay, the last post for a little while, this is the beginnings of my horde. I hope the picture demonstrates my aim that in painting groups of walking dead, those Zombies should hopefully still be able to form up as a varied horde. I hope to add to this soon and already have more minis in various stages of painting (as is always the case with my minis collection!). 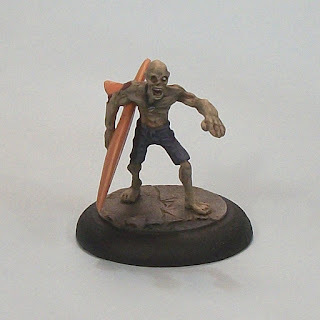 Another Hasslefree Zombie, painted with the tail-end of my recent Zombie splurge. I was unhappy about a couple of issues I had with this one. Firstly was the white undercoat I used: GW Skull White (possibly an old can). It gave a slightly fuzzy texture to the undercoat which although I have heard this happen to others has never really happened to me that I can recall (maybe I blocked out such trauma!). 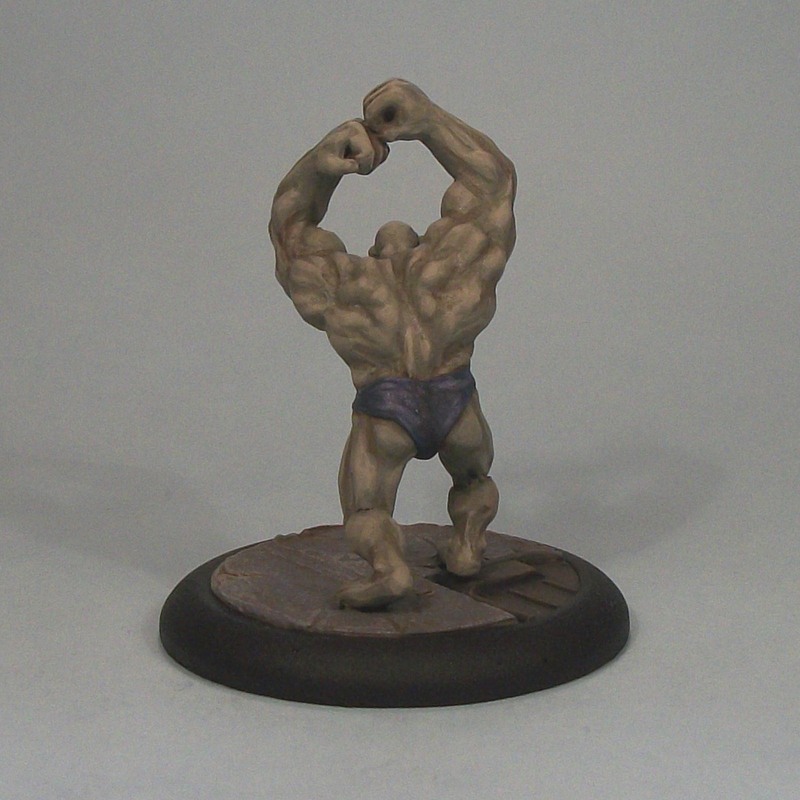 Having a deadline for a game we played last month, it meant I did not have time to strip and re-undercoat the mini, so I had to press ahead and probably ended up painting extra base layers as a consequence. The second issue is definitely down to me. After the efforts of September I tried to go back at a later date to add a design to the 'upper' side of the board (as would be to the rider's perspective), but that did not turn out well so got painted over. My plan was clear, however my freehand skills were lacking and so I will not be trying again on this mini. I just decided to accept it as-is, rather than increase my own frustration. Anyhow, another addition to the 'horde', and expect an interim shot of the living impaired I have painted so far to appear very soon. 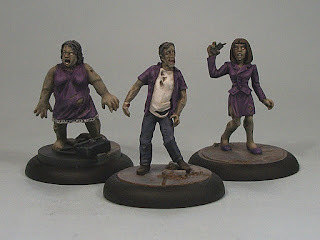 The last Zombie update post for a while, and my third group of 3 (I have lots of future groups planned BTW!). Purple theme this time. I will try and do a group shot of the infestation so far to give a sense of how they look together, but meanwhile I will leave you with this. Left and middle are Studio Miniatures , while the one on the right is Crocodile Games. Bases left and right are Fenris Games, middle base is Dragon Forge. 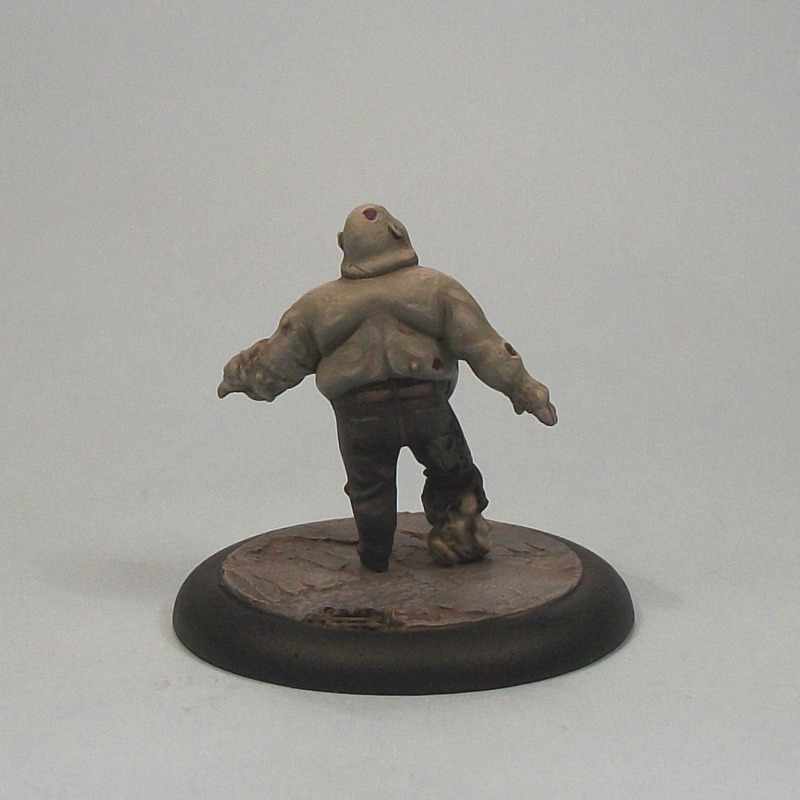 Another Big or Boss type Zombie, this time one of two from Fenris Games (hello Jo and Ian!). 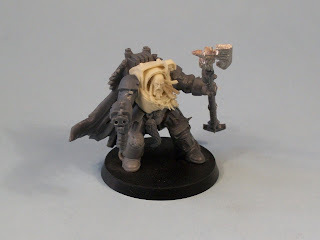 Fenris have a great offering of minis, bases and scenic pieces as well as taking on custom work, so suffice to say I have picked up a number of things from them. Just wish they would get their non-ebay web-store sorted! As ever, please embiggenificate by clicking the images. I enjoyed painting this one, and even if it may be inspired by some game or other (possibly; I don't play many video games so cannot comment), I just viewed it as an opportunity to represent a character-type or focus Zombie. The other one is multi-part with slightly awkward join surfaces, meaning it has fallen down the pecking order. Still some more Zombies yet to be shown, and I have others in the pain queue so please stay tuned. 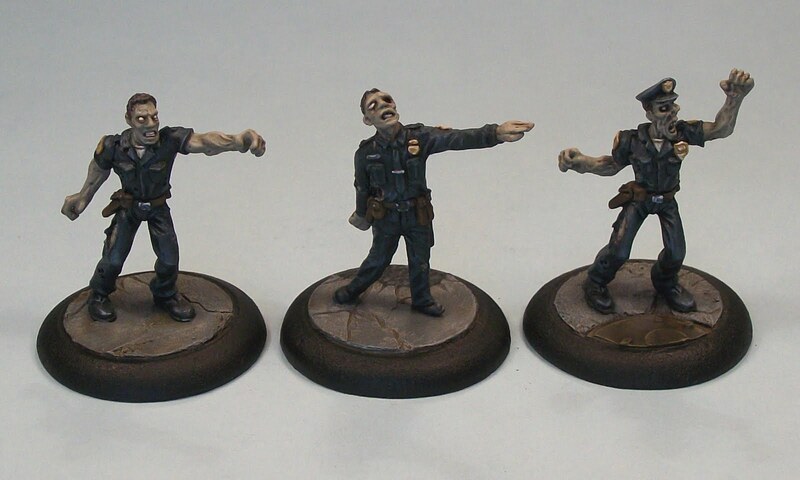 Well the title says Zombie Group (1), but this is actually my second finished 'group' of Zeds after painting the previously posted Cops. The groups will be marked by thematic colour schemes, which will be dominated by the colour chosen for their tops, shirts, jackets, dressing gowns, or whatever. The plan is that en masse the colour-theming should not seem too obtrusive, yet in game-play will mark them out easily. Click the picture to embiggenify. I have taken to paining some of my 'rank and file' type Zeds in 3's for a couple of reasons. Firstly is that when playing Pulp City (see the Pulp Citizen blog here), Zombies are fielded in groups of 3 models, so this gives me options there. Secondly, but it probably helped speed up the painting process a little with only a limited palette in use. These three minis are all Studio Miniatures (if memory serves me!). I love the characterful touches on the Zed in the dressing gown/bathrobe* (* delete according to personal brand of English! ), with the bunny slippers and broken mug still being clutched. Bases are by Fenris Games. 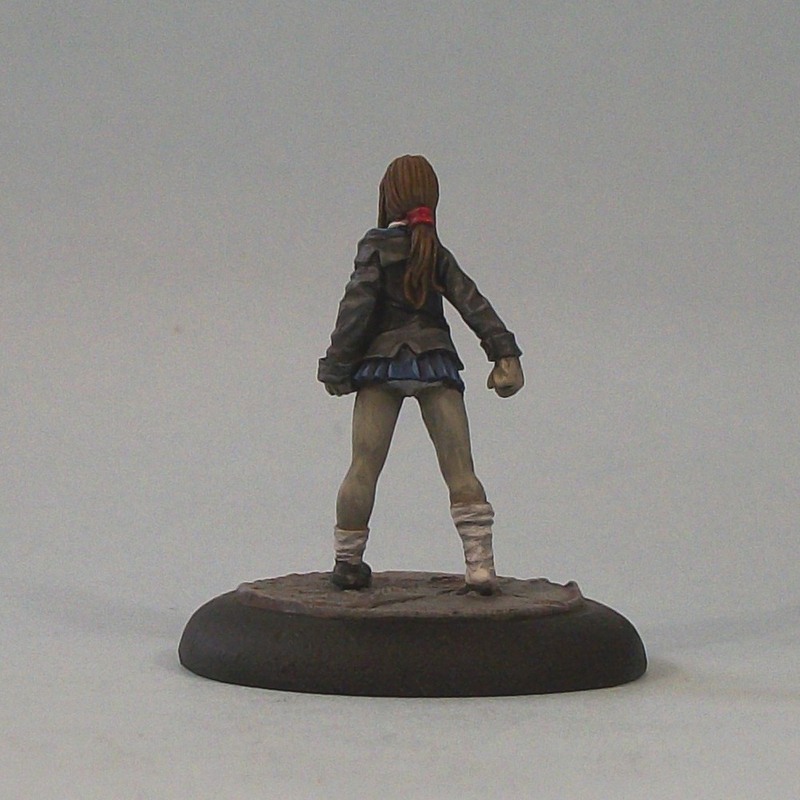 I have a lot more Studio Miniatures walking dead to paint, so stay tuned. This Zed was painted pretty quickly (and it probably shows!) amid my Zombie painting frenzy of sorts during September. Click to embiggen pictures as usual. 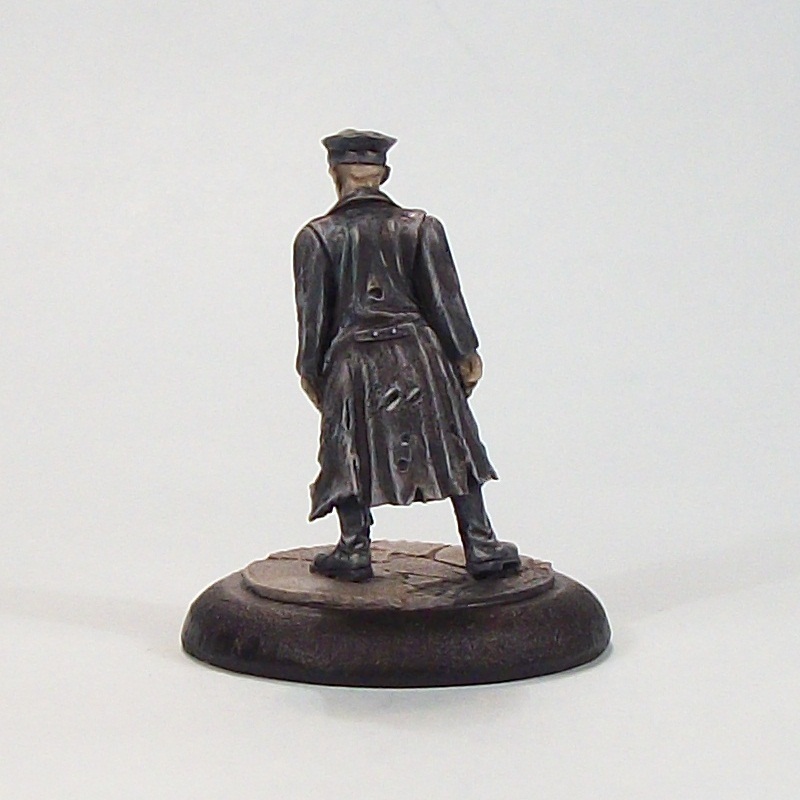 I really liked this characterful model the moment I saw it, and ordered one ages ago. 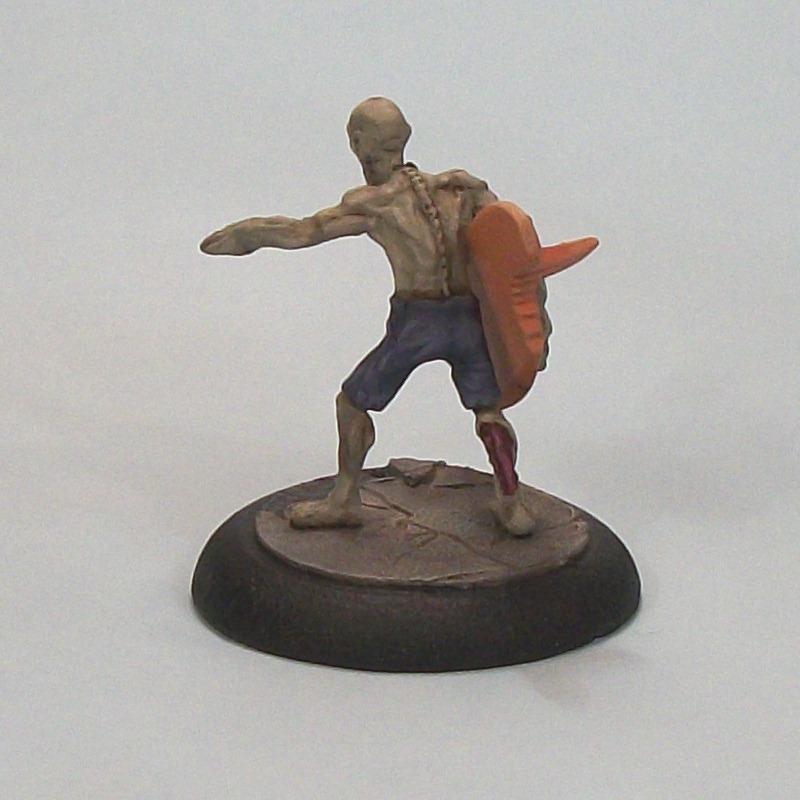 Suffice it to say that it remained sat in my (ever-growing) Zombie-minis-mountain awaiting painting. 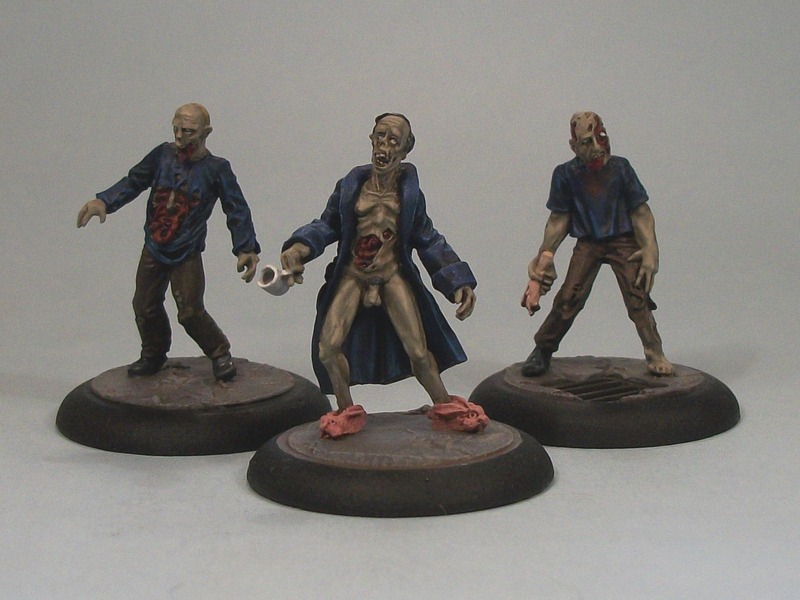 Thankfully, said Zombie-minis-mountain shrank a little during September, and has yielded a number of painted and soon(ish) to be painted/completed zombies for my planned horde. The mini is from Hasslefree (if I recall correctly) and is one of a number of their Zombie offerings. 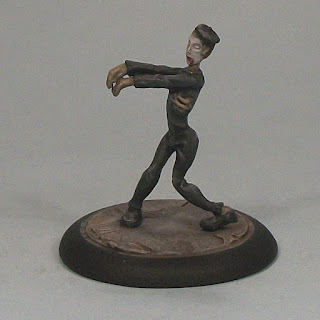 My usual Zombie-skin-recipe was applied, and the black clothes were worked up from a base of Vallejo black-grey highlighted with lighter grey tones, and some thinned-down GW Badab Black wash. Mounted on a Fenris Games base. 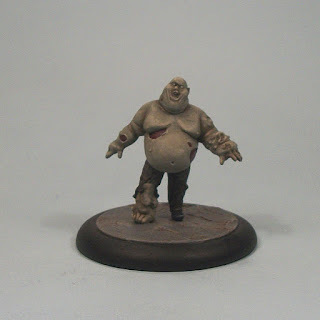 Painted as part of the beginnings of my planned walking dead horde. This mini is from Tengu Models from their selection of boss-type Zeds. The mini came with integral base (which is something I hate on the whole, I have to say), but Tengu very thoughtfully made it a thin disc so a straight forwards matter to trim it off. Painted with my usual recipe of Vallejo Green-Grey as a base skin tone, highlighted with increasing addition of Basic Skin Tone. The skin was washed with thinned down Devlan Mud (GW). The base is by Fenris. 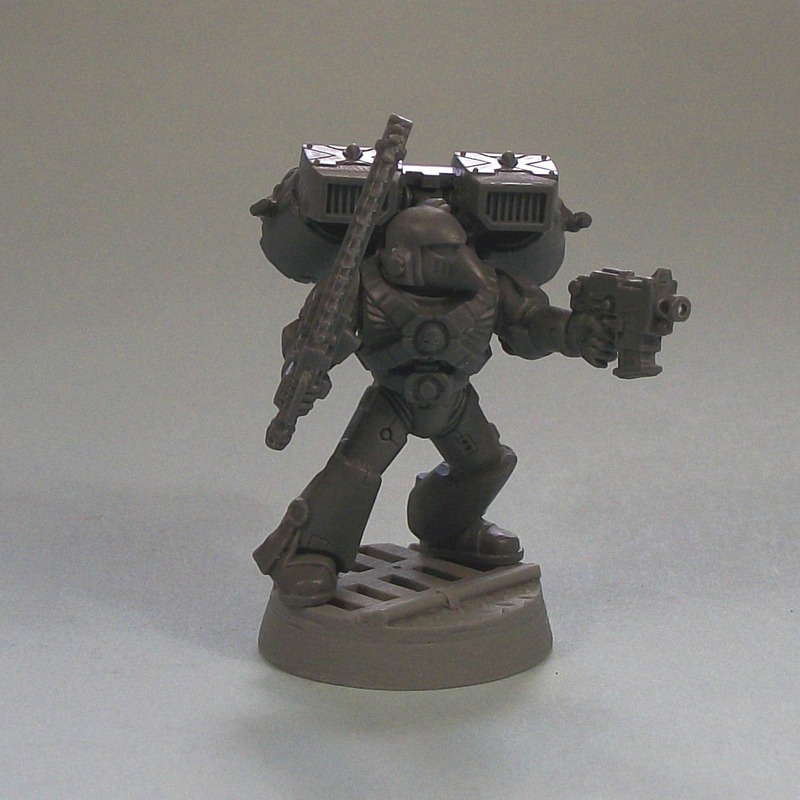 I will be mounting 'regular' Zeds on 30mm bases, and Big or Boss Zeds on 40 mm bases. Look for more zeds in the coming days and months. 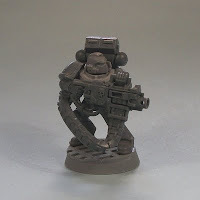 Several featured in a Battle report that I will be posting soon on the Pulp Citizen. I have been beavering away on a number of Zombie minis, from a number of manufacturers including Hasslefree, Cold War, Studio Miniatures, Tengu and Crocodile Games. Since the Zombie Cops were finished, I have painted another 6 Zombies, with another 12 or so in various stages of painting (let alone the mountain of under-coated and unprepared Zeds awaiting work...), so expect some Zed updates soon! At least I think that is the line from the wonderfully trashy mid-80's zombie movie 'The Return of the Living Dead'. 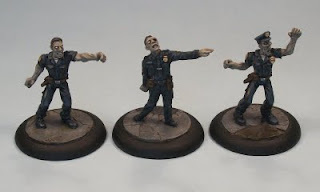 Three Zombie Cops; I settled on 3 since that suits my Pulp City gaming needs and also meant I could batch paint them. Not quite as good paint-work as on Suzi previously I guess, but I was trying a new black technique I have been working on. What is the Breast Cancer Brawl? The Breast Cancer Brawl is an effort to raise money for breast cancer research, advocacy, education, and support organizations. The event is a fantasy table-top miniatures tournament and… painting competition using the popular WARMACHINE and HORDES game systems. The above text is from the 'About' section of the Breaster Cancer Brawl 2011 site (here). My understanding is that the organisers want to spread it beyond the identified games to include games such as Pulp City. It is self-evidently a good cause and so I decided to draw attention through my blogs. Gaming in a good cause - there is not much to add to that really, is there? Okay, I wasn't planning to show these until they were all finished, but Rob insisted, so here is the pre-undercoat assemblies. These are kit-bashed from a number of GW Space Marine kits, mainly Command Squad, Devastator, Blood Angel, Space Wolf and Dark Angel kits with at least one Forge World torso for good measure. I probably need to green-stuff one or two locations, and I was thinking of adding some extra purity seals, but I don't know about that since I would like to get on with painting them. They are for our Thursday night gaming group and with my house move a couple of months ago fell off the painting radar (or should that be auspex?) as a consequence. 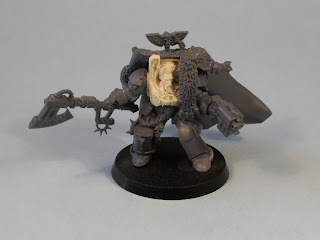 Imperial Fists Devastator - I am not looking forwards to doing the Chapter icon. 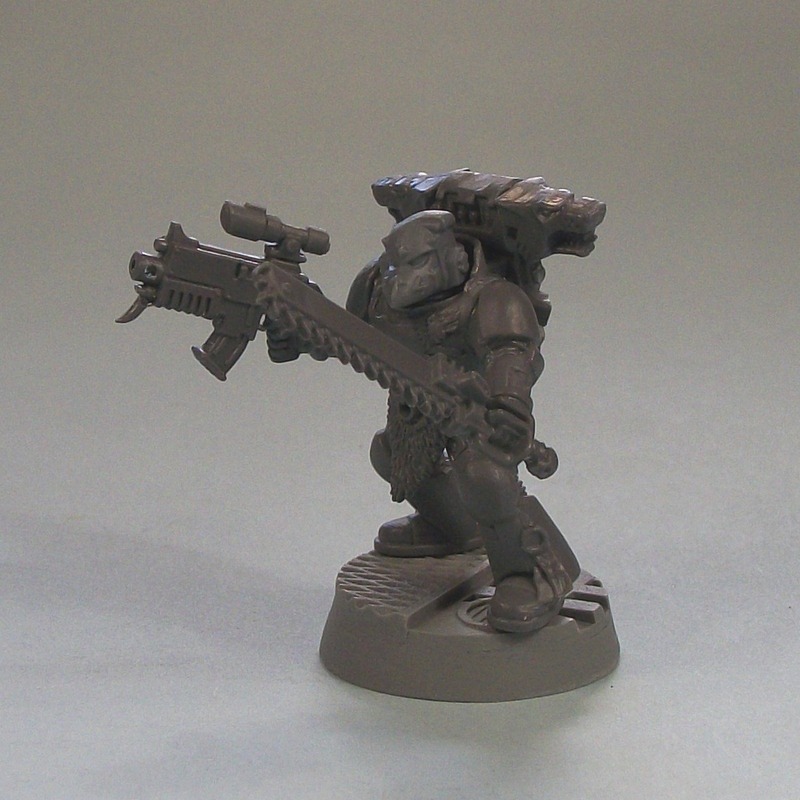 Space Wolves Tactical Marine (I guess that should read Grey Hunter). Okay, just throwing this out there if anyone can help. Too late in the day i have gained an appreciation of the Nocturnals comic book. 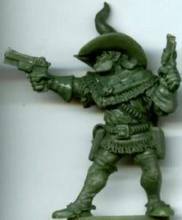 There was a RPG supplement relased by Green Ronin around 8 or 9 years ago, and they released this promo figure with it; so if anyone can help I would love to buy a copy of the Gunwitch mini and will pay a fair price. Not from me, just passing it on. I agree with pretty much every point included, and I want to see GW sustain, therefore I have posted this. I am not anti-GW, nor is the guy (Matthew from Mini Wargaming) behind this video, but I think the message in the video is important. Sorry for the delay after my last post. This is the tester for what I hope will eventually be a true zombie horde. 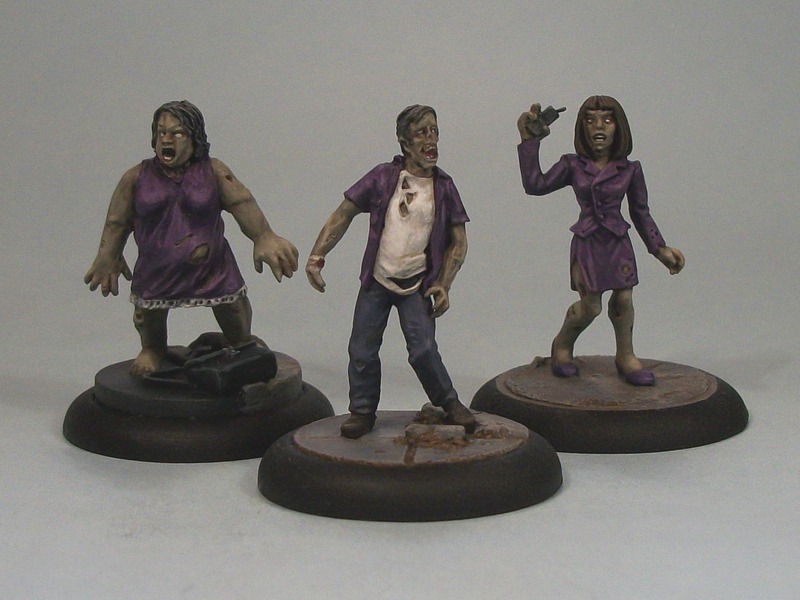 The horde is intended to feature in a Pulp City game I have planned for later in the year against my main gaming buddy Rob, but since the walking dead will all be non-Pulp City minis, they will be posted here. 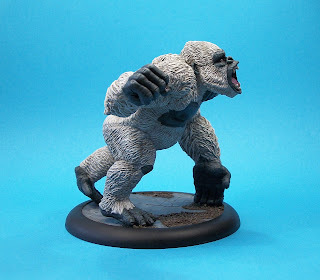 This one is from Hasslefree (Kev White), and was nice and simple to paint - just what I needed from my tester. 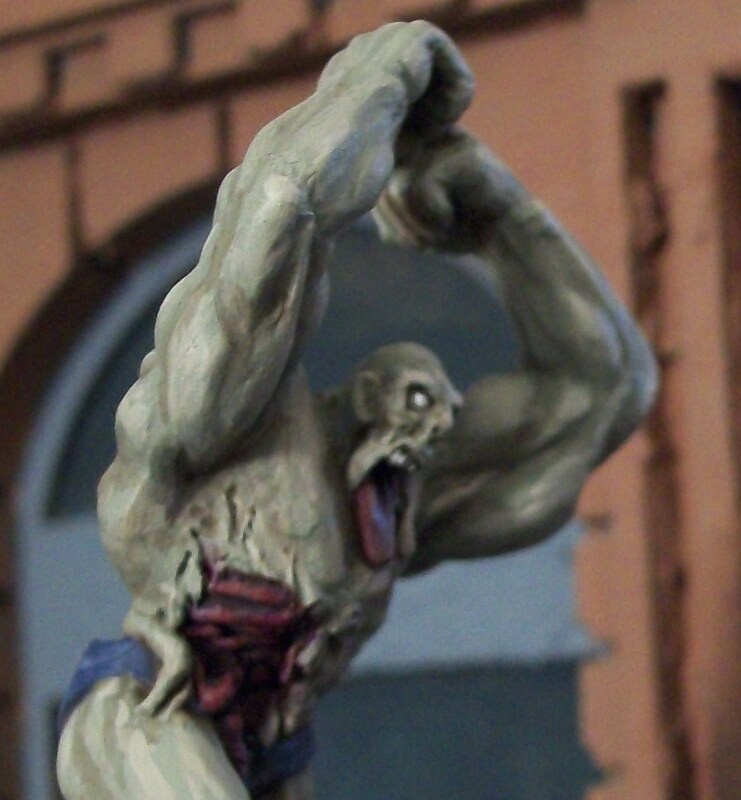 The skin tone was based on Vallejo Green Grey (Model Color 70886 or 101) highlighted with mixed in Basic Skin Tone (MC 70815 or 017), and I think that will be the base tone for most of the horde. A ton of other zeds have been prepped and based, from a few manufacturers (Studio Miniatures, Crocodile Games, Tengu, and at least one RAFM), so hopefully this horde will grow over time. Okay, it looks as though I am a published writer outside of the environs of my blogs! Issue 7 of the Ancible, a tabletop gaming magazine, features an original article written by me; titled 'Vanity Fayre' you will have to read it to find out what it is about. But don't worry - the Ancible is free to download - just follow this link here. I imagine Aquamarina is some kind of Unhuman mutate empowered with the ability to transform into a form of water. Or maybe she is some kind of water elemental type? Who knows. This mini is one of a burgeoning number of supers to be found in the Chronoscope range from Reaper, and known by a different name in that range to the one I have chosen. The mini is effectively one of a set of four classical-element themed female supers in the range, and I will get to the others in good time. 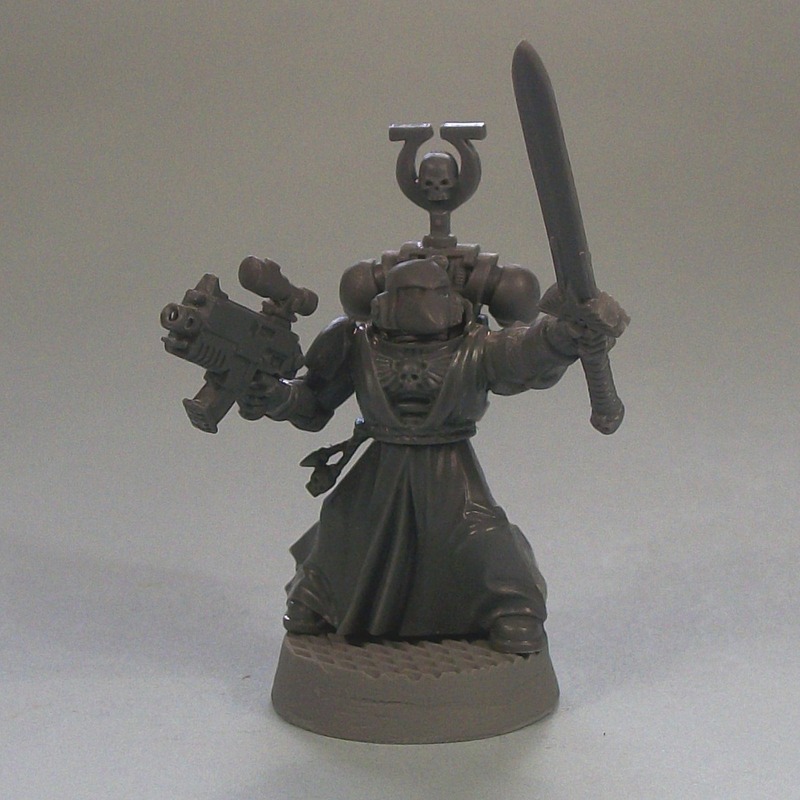 While it was nice to see supers in the Chronoscope range, I feel that more recent sculpts have been better than a couple of the initial supers minis (with some notable exceptions among those first few). Obviously anyone who follows my Pulp Citizen blog knows I am a supers nut, so expect to see quite a few in the coming months if I can keep my present motivation for painting. But rest assured other stuff is in the pipeline, so hopefully this blog will live up to its name. 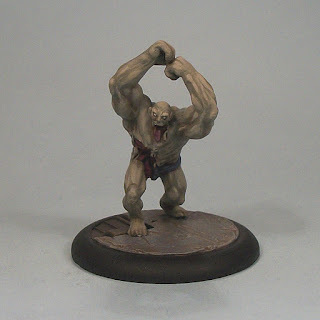 I have posted this already on Pulp Citizen, but for anyone not reading that blog I though I'd kick off posting with some minis I have painted and/or photographed in the past year or so. The backdrops vary quite a bit in those older pictures, as I am still trying to get to grips with my miniature photography, so please bear with me. First up is the mighty giant silver ape Kabaka K'Wana. I have already used him in Pulp City games so far, but hopefully he well also see use in some pulp and Victoriana themed games as well. 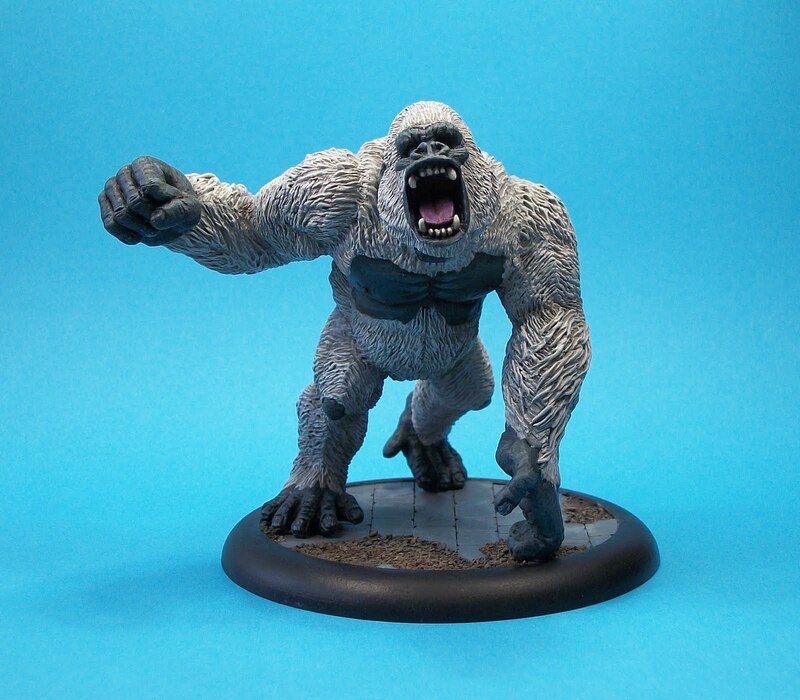 Kabaka K'Wana is from Reaper's P-65 range and is a big beast in every sense, and very weighty too. To match in with basing for my other minis, the interior of the base (an 80 mm recessed piece from Fenris Games) was a simple scratch build using sand and plasticard to try and evoke a paved effect; basically I wanted something that would look okay in some forgotten temple or even urban streets. Welcome indeed to anyone checking this new little blog out. The title is a bit of a mouthful I know, but it has been cooking at the back of my brain for some time. This isn't my first (or even second) blog, yet this is intended to be the most diverse one that I maintain. My first blog was and is Pulp Citizen; a gaming/hobby blog with a very narrow focus. I hope that the Eclectic Gentleman Tabletop Gamer presents a much wider view of my tabletop gaming hobby pursuits than the Pulp Citizen can offer. Not that I am unhappy with Pulp Citizen - far from it - but that was always intended to focus on one game and any tangential influences on my hobby endeavours with that game (painting and playing). The Eclectic Gentleman Tabletop Gamer will focus on my tabletop hobby in most areas except Pulp City - that will remain the preserve of Pulp Citizen. Some crossover may occur, but that will be stuff not explicitly Pulp City in nature.